This is perhaps Dannhauser’s only original design. He was a builder who began to dabble in single- and multi-family residential design in the mid-’60s, but he died in 1969 before he could get the ball rolling on most of his projects. This highly customized hexagonal gem is the exception. The Duncan family moved in soon after the home was completed; they and the home were featured in the October 16, 1966 edition of The Oklahoman. The family lived here for over 25 years before moving on, but subsequent owners must have appreciated the home as much as the Duncans because very few (and minor) changes have been made over the years. 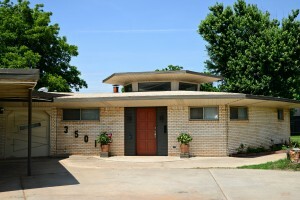 Go to the Mod Blog to read more about this great home.